Being a trek lover, I usually spend my Saturdays & Sundays on treks. I am an active leader of 'Rock Climbers Club' and 'Guerilla Adventures', so I have started buying good quality adventure gears for trekking. I have done my many previous treks on floaters. Floaters of 'Weinbrenier' brand by 'Bata' give a good grip during trekking and I have experienced it during my many previous treks. But they (even all floaters) are useless in mud walk. This has been experienced at Kalsubai Peak Trek by me and then I decided to buy good trekking shoes. But this was really confusing when you find that there are many brands with good trekking shoes in the market. A general tendency of every buyer is 'More the price, better the quality'. Hence I thought 'Ventiv 500' by 'Quechua' will be the best option for trekking in Sahyadri and good thing was they were in my budget. Even later this decision I took a public trek of 'Rock Climbers Club' to 'Gorakhgad' in Murbad area. That time I saw many participants were wearing 'Action trekking shoes'. To have a review I enquire about it to the participants who were wearing those. Niranjan (who became a good friend of mine from that trek) was also wearing those shoes and he was very comfortable with them. After trek, I googled 'Action Trekking Shoes' but found no worthy information on it. I went to few shoe shops and enquired there also. ‘अरे साब, ट्रेकींगके लियेही ये शूज कंपनीने बनाया है | बहुत लोग लेके जाते है | और ये सस्ता भी है |’ (Sir, company has made this shoe for trekking only. Lot of people have bought. And these are cheap too.) Almost every shopkeeper was advising this and my heart was telling that ‘They are seller so they might be telling anything.’ A good this about these shoes was that they were cheap and were available in two types, ‘High Ankle’ for Rs. 800/- and ‘Low Ankle’ for Rs. 700/-. We all trekkers are always miser in case of budget and costing but this was a question of ‘Safety’, hence safety became priority than money. Still I decided to use them in a small trek to test them and thought that if it works then will continue to use or will use it for regular use. And thus I after-all bought these shoes of High Ankle type and used them for 2-3 days in regular use to make them ready for treks. My next trek was ‘Avchitgad’. It was a very easy trek but we had to face lot of scree, mud, slippery rocks full of moss etc. Felt good as I got a chance to test these shoes there. And after using these shoes in this trek, I would like to inform you friends that these should really performed well. 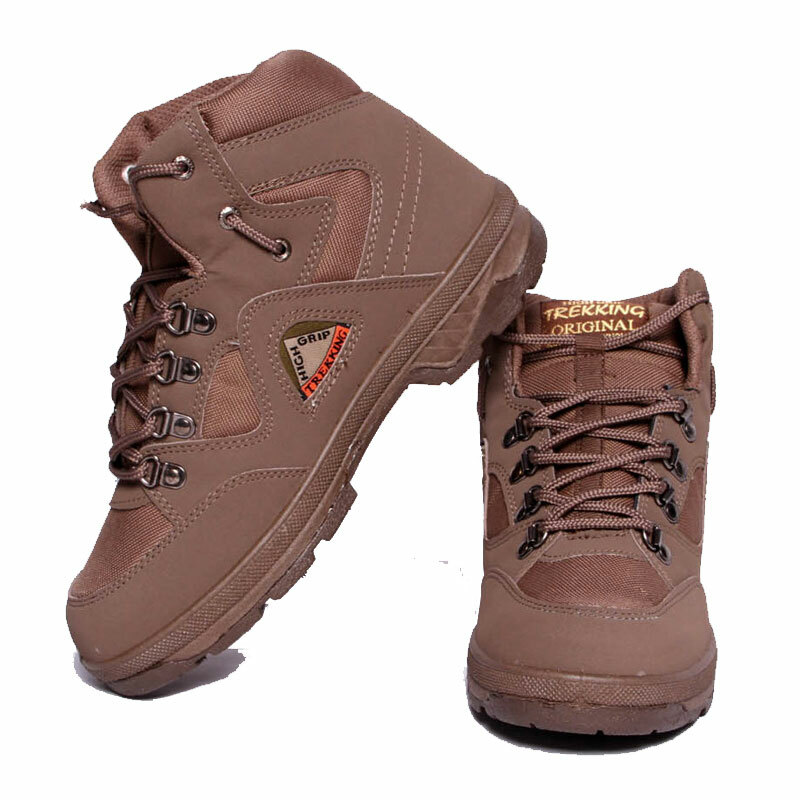 If we think of comfort, the extra padding of these shoes give a nice treatment to our feet while trekking. They are quite water resistant too. Its high ankle gives our feet a good support and avoids sprain. The best feature of it that they are cheap. I have tried to present below the pros and cons of these shoes based on my experience. It has a good grip. It has a single sole with good quality moulding. Upper shoe is made from good quality thick canvas with good quality padding for extra comfort for feet during ascending and descending. The lace allows us to loosen or tighten the shoes as per choice and comfort. Shoes consist of a technology similar to shock absorbing that is provided under insole below heels. This system also keeps the air ventilation inside shoes to keep feet fresh and this is a must for long run treks. They are light in weight hence can be kept in sack or hooked on sack. They are attractive and are available in 3 colours ( Black, Brown and Olive Green) in market. They are water proof in 3 inch deep water/mud (up-to thick net made on above toe in this shoes). Its high ankle gives our feet a good support and avoids sprain & provides safety from scorpions, insects etc. If used well, I have seen many trekkers using these shoes for years. And best feather is its reasonable and cheap price & it’s made in India. The main drawback of these shoes that it insole gets damaged fast. During rain treks or long run treks, especially on slopes, its insole starts getting rolled or folded under feet that damages it fast during trek and we are left no option but to change or replace it. But if we consider the price of insoles i.e. Rs. 20/- to 30/-, this cost is negligible. Another drawback of these shoes is they are water proof in only 3 inch deep water/mud i.e. only up-to thick net made on above toe in this shoes. If we have to cross deeper water level or stream, then water enters in shoes through the net and becomes wet inside too. But we find similar problem in other branded shoes too.